"There was a cinder block that had the year 1967 etched in it, and inside, the time capsule had been stored away." WALKER, Mich. - Time capsules are always fascinating items to find. They are a historic cache of goods or information meant to communicate to the future. They are often created and buried during celebrations and can be a cornerstone laying for a building. That's what construction workers and administrators at Kenowa Hills' Central Elementary School found out last summer. "Over the next several years, our entire school is getting a complete makeover," said Cherie Horner, who is the school's principal. "While tearing down the main entrance to the school, construction workers found a time capsule hidden inside a hollow cinder block." The block has the year 1967 etched into it, and was embedded inside the exterior wall of the school when it was built 52 years ago. Workers excavated around the block, and when they removed it, they found a copper-colored box inside. 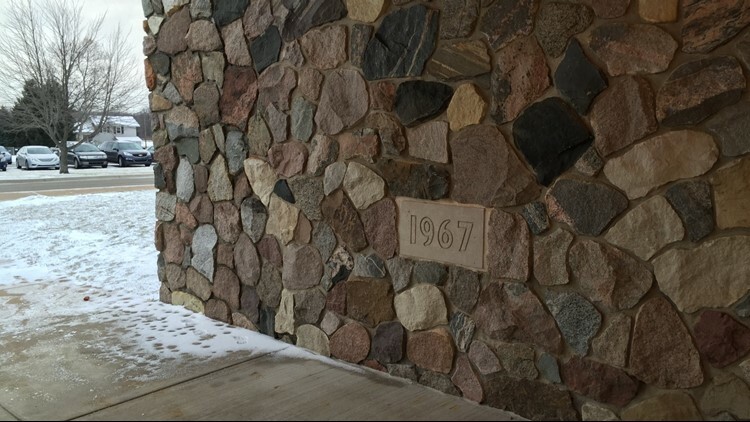 The hollowed-out cinder block, which contained the time capsule, was built inside the wall when the school was constructed in 1967. These are photos of what that area looked like before renovations began at the school in the summer of 2018. "Initially, the superintendent and I thought we would save the time capsule for the grand opening of the school once construction is finally complete in 2020," said Horner. "But, we decided that the better date would be during our board meeting on November 12 because who wants to wait almost two years." Once it was finally opened, an interesting collection of artifacts were found inside. "There were no spiders, but there was a lot of paperwork," joked Horner. "I was a little bit worried about the contents because, after all, it was the 1960s." There were three course schedules placed inside the capsule. One for each grade: 6th, 7th and 8th. There was also a research-based guide book, detailing how administrators should run a school. There's a middle school handbook which tells students what to wear to class and how to act. Also included is a calendar with photos of past school board members and a few of the classrooms as they looked in 1967. Also inside the time capsule was a newspaper clipping, memorializing David Raap, a boy who would have been a sixth-grader at the school in the fall of 1967 had he not passed away from brain cancer in January of that year. "As a parent, you want to make sure that your children's legacy lives on," said Horner. "What did David's parents hope we would remember about David was found [in this time capsule] over 50 years later." This is the hollow cinder block that was removed during the ongoing remodel at Kenowa Hills Central Elementary School. Inside this block, the time capsule sat dormant for 52 years, until it was discovered in the summer of 2018. 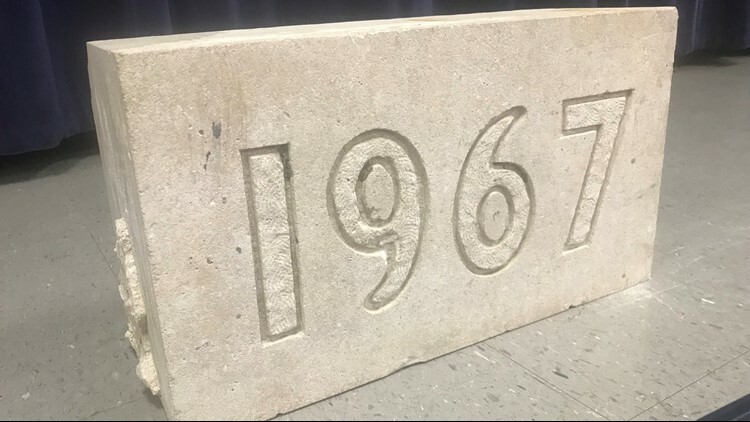 Since the time capsule was opened Nov. 12, the school has posted video and photos of the unveiling ceremony, hoping to leverage social media into finding who might have been responsible for putting together the materials and planting the capsule inside the cinder block. "We've gotten a lot of speculation but no one has stepped forward to say, 'We know what's in there.'" said Horner. "It would be great if someone who knew more information could come forward. "We'd like to know why these particular artifacts were chosen to be saved in the time capsule. Was this just random, or did these items matter to somebody for some reason." 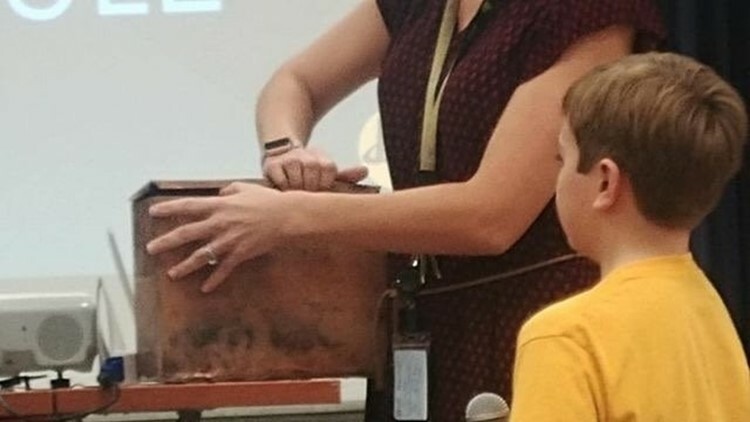 On November 12, 2018, school administrators opened the time capsule to see what the contents were inside. Among the artifacts they found inside were three class schedules, a student handbook and a newspaper clipping memorializing a former student. For now, Horner says the time capsule will remain in her office. It's already become an important teaching tool at the school, as many kids have asked endless questions about it. "If we weren't currently undergoing a massive renovation and reconstruction project here at the school, I don't think this time capsule would have been found," added Horner. "Each student that's currently attending here today has a part in this history, even though they may be too young to know that now." If you know of a story that should be featured on "Our Michigan Life," send a detailed email to: life@13OnYourSide.com. We'll be sure to follow-up.